Home / Whole Nursery / Lets get messy! The learning opportunities that come from exploring messy play resources are endless. 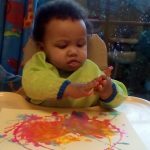 We promote mark making activities right from our Caterpillar Room to encourage babies to engage with their senses, build their fine motor skills and develop their understanding of movements and the marks they can produce.